I’ve been invited to come in and have an informal chat about open access with the Linnean Society on March 24th this month. Particularly with regard to what is and what is not ‘open access’ in terms of Creative Commons licences. I write this blog post to spur on other advocates to try and encourage their society journals to use proper, open access compliant article licencing that facilitates rather than prevents text & data mining. I have Tom Simpson at LinnSoc to thank for reaching out to make this happen. Thanks Tom! It started from some tweets I sent a few days ago about an interesting new Zoo J Linn paper by Martin Brazeau & Matt Friedman. I’d include a pretty figure from this paper if I was allowed to, but unfortunately because it’s licensed with the Creative Commons Attribution-NonCommercial-NoDerivs License (CC BY-NC-ND) I can’t. To repost just a figure from the paper would be to create a smaller derivative work which the licence does not allow – I am only allowed to repost the *whole* article with absolutely no changes which is rather impractical for a 43 page article! Wiley in particular have a history of threatening scientist bloggers for reproducing a single figure from an article (read the Shelley Batts story here). It’s not just bloggers, and the outreach possibilities for the paper that are harmed with the use of such restrictive licenses – it also causes problems for RCUK funded researchers. Matt Friedman is based at Oxford at the moment – if the funding for this work came from any of the UK research councils, then the choice of the CC BY-NC-ND license could cause him problems – it is NOT compliant with the RCUK’s policy on open access. Wiley should know better than to offer this license to UK-based authors, but they have a significant conflict of interest in ensuring researchers choose more restrictive licencing options so that they can continue to be the sole proprietor of glossy reprint copies (ensured by the -NC clause). Both the -NC & the -ND clauses incidentally prevent the figures from being re-used on Wikipedia, another sad restriction for the authors who must have put a lot of effort into them. In the realm of academic science, the application of that particular license to the paper-as-a-whole-work just doesn’t make sense. Many digital research projects need to be able excerpt, transform and translate research outputs such as academic papers, and in some cases create commercial value from this. My current BBSRC-funded research project ‘PLUTo: Phyloinformatic Literature Unlocking Tools. Software for making published phyloinformatic data discoverable, open, and reusable‘ relies on being allowed to transform, excerpt and republish extracted content from scientific papers. With Peter Murray-Rust we’re using text & image mining tools to generate open, re-usable phylogenetic data directly from the published literature, often directly from PDFs. The Linnean Society have several good quality, well-respected journals which publish phylogenetic content, so they’re very much in the scope of our PLUTo work. But clauses such as -ND stop us from using this material. It’s clear in the license terms and conditions – we are not allowed to make any derivative works from the original. So any papers using CC BY-NC-ND we will have to avoid. We cannot use them, and therefore they will not be cited by our project which is rather a shame for their authors. Above all the CC BY-NC-ND license simply isn’t compliant with the very definition of open access as laid down over a decade ago at the Berlin, Budapest, Bethesda meetings. Wiley are knowingly mis-labelling articles using non-compliant licences as ‘open access’ even though they are by definition NOT open access. I hope the Linnean Society can spur Wiley to do something about this as it is not good for the journal, or its authors. Other journals using non-compliant licencing use terms like ‘public access‘ or ‘free access‘ or ‘sponsored access‘. Why can’t Wiley follow this lead? Open access is more than just free access – it enables re-use which is critical for research projects like mine. Please stop the ‘openwashing‘. Hagedorn, G., Mietchen, D., Morris, R., Agosti, D., Penev, L., Berendsohn, W., and Hobern, D. 2011. 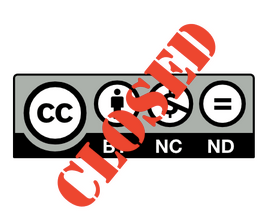 Creative commons licenses and the non-commercial condition: Implications for the re-use of biodiversity information. ZooKeys 150:127-149. Mounce, R. 2012. Life as a palaeontologist: Academia, the internet and creative commons. Palaeontology Online 2:1-10. Klimpel, P. Consequences, Risks, and side-effects of the license module Non-Commercial – NC [PDF] 1-22.